Terra Forming Terra: Samson Seal ? Folded into the context of the Bible are a number of fully developed separate stories or even what we would describe and accept today as novellas. They have a legendary flavor and while inspired by real careers, by the time they reached acceptance for inclusion in the scriptures, they had quite naturally been edited, polished and augmented with the single acts of others. No one would have ever considered our concepts of historical accuracy when the main event was to save anything for posterity. Imagine the Great Hero Neil Armstrong who single handedly nada nada nada. That is what makes a tale legendary. It is too tempting to cram in all the good stuff that is possible. Man confronting lion is a common theme and likely has nothing to do with any historical Samson. However it certainly confirms the historical milieu that then existed. It was something folks took seriously. 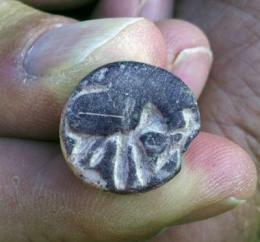 Tel Aviv University researchers recently uncovered a seal, measuring 15 millimetres (about a half-inch) in diameter, which depicts a human figure next to a lion at the archaeological site of Beth Shemesh, located between the Biblical cities of Zorah and Eshtaol, where Samson was born, flourished, and finally buried, according to the book of Judges. The scene engraved on the seal, the time period, and the location of the discovery all point to a probable reference to the story of Samson, the legendary heroic figure whose adventures famously included a victory in hand-to-paw combat with a lion. While the seal does not reveal when the stories about Samson were originally written, or clarify whether Samson was a historical or legendary figure, the finding does help to "anchor the story in an archaeological setting," says Prof. Shlomo Bunimovitz of TAU's Department of Archaeology and Ancient Near Eastern Civilizations. Prof. Bunimovitz co-directs the Beth Shemesh dig along with Dr. Zvi Lederman. "If we are right and what we see on the seal is a representation of a man meeting a lion, it shows that the Samson legend already existed around the area of Beth Shemesh during that time period. We can date it quite precisely," Prof. Bunimovitz adds. The right place, the right time The seal was discovered with other finds on the floor of an excavated house, dated by the archaeologists to the 12th century BCE. Geographically, politically, and culturally, the legends surrounding Samson are set in this time period, also known as the period of the Judges, prior to the establishment of kingship in ancient Israel. The area of Beth Shemesh was a cultural meeting point where Philistines, Canaanites, and Israelites lived in close proximity, maintaining separate identities ad cultures. Samson's stories skip across these cultural borders, Dr. Lederman says. Although he was from the Israelite tribe of Dan, Samson is frequently depicted stepping out into the world of the Philistines — even searching for a Philistine wife, much to the chagrin of his parents. Although Samson did have some positive interactions with the Philistines — his infamous lion brawl took place on the way to his bachelor party with a group of Philistine men prior to his marriage to his first Philistine wife in Timnah — he is also reputed to have fought against the Philistines. In one tale, this ancient superman is said to have killed 1,000 Philistines with a single donkey's jaw bone. "Samson has a very legendary aura," explains Dr. Lederman, calling the Samson stories "border sagas." On one hand, Samsom could cross the border and interact with the Philistines, but on the other, he met with danger and various challenges when he did stray out of his home territory. "When you cross the border, you have to fight the enemy and you encounter dangerous animals," Dr. Lederman says. "You meet bad things. These are stories of contact and conflict, of a border that is more cultural than political." Cultural connections and conflicts The Philistines were immigrants, one of a number of so-called "sea peoples", originating from the Aegean region. They settled along the southern coastal plain and the lowlands of present-day Israel, including Ashdod, Ashkelon Gaza, Gath, and Ekron. Here they created their own cultural and political enclave and were always seeking to expand their own territory. "The flourishing Canaanite village of Beth Shemesh, despite frequent destruction caused by their aggressive neighbors, was not abandoned or won by the Philistines and retained its original culture and identity", Dr. Lederman adds. The border disputes and the Canaanite resistance to growing Philistine pressure and cultural influence created some identity changes, Prof. Bunimovitz believes. This period of contact and strife may have been the "meat" of the Samson legend incorporated in the Book of Judges, the seventh book of the Hebrew Bible that tells the stories of figures who champion the Israelite cause and fight against oppression through this historical period.